This PCA Products screen door is not your average screen door. It has a heavy aluminum frame, which is adjustable to fit the size of your opening. It can also be adjusted to hang from either the right of left side. 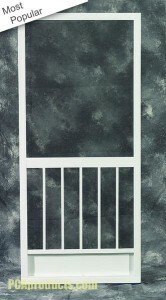 This screen door comes in a Sandstone color, which is shown below next to the picture of the door. In store pick up only.